Announcing "Roadtripper", a preset pack for Aurora HDR 2018! Roadtripper: a preset pack for Aurora HDR 2018! Hello friends, today I am announcing my first preset pack for Aurora HDR 2018. I have been working with this wonderful product for a while now, and have hand-crafted these presets to help you get the most out of your Aurora HDR 2018 experience. You can do SO MUCH with Aurora HDR 2018 that it will blow you away. It has been a lot of fun for me to crank out some beautiful HDR photos with it! You can find my other preset packs right here on my presets page if you would like to see them all (but this is the only pack available right now for Aurora HDR 2018). I love to create these preset packs and I use them on many of my images, too. I think of presets as the “easy button” for photo editing. Sometimes it really just takes that one click to get your shot looking exactly how you imagined it, although of course there are times when a preset is a great starting point to send you off in a new creative direction. Either way, I know you will enjoy this new preset pack and get a lot of mileage out of it. If you have been following me since before this past summer, you may be aware that I took a massive road trip with the family over the course of June, July and August and we covered about 9 states and 2 Canadian provinces. Dang, it was a hell of a lot of driving (but a lot of fun too). On this trip, I captured thousands of photos and these were the inspiration for this preset pack. These presets range from something you could use on a beautiful sunset and go all the way to a grungy, rusted out old truck - because that is the entire range of what I photographed on this road trip. These presets are designed to work with ALL sorts of scenes, just as you would encounter on a road trip yourself. I like bold, colorful and expressive photos, so my presets are designed to accentuate that, and I think you will be able to see that theme in the sample screenshots below. There are 20 presets in this pack and once loaded in Aurora HDR 2018 it will be displayed as it’s own category of presets, right alongside all the other categories that are built into Aurora (see below for installation instructions). Go watch it in action! Ready to purchase this preset pack? You can click on “Add to Cart” below, or visit my presets page. 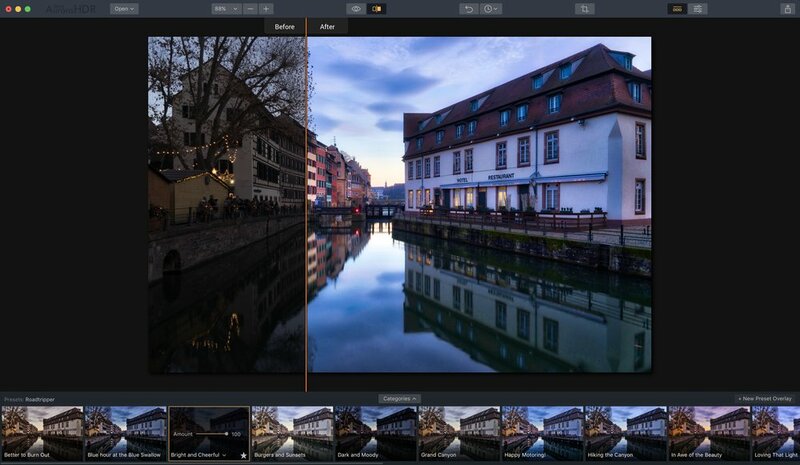 Once you complete the purchase process, you will receive an email with a download link for the preset pack file, which you can then import into Aurora HDR 2018. Installation instructions are below. It sells for the low price of $10.00. That's just $0.50 per preset! Think of all the amazing creations you will use these on! See the example to the right. --> Roadtripper is in the bottom right hand corner. After you receive your email with the download link, download the preset pack file to your desktop which allows you to easily find it and select it. Ok, it’s about time to do that, don’t you think? Take a look at all the screenshots below and any of them can be viewed larger with a single click. You will also see the preset name in the screenshots below. This is just a few of them - remember, there are 20 presets in the pack! Thanks for taking a look and let me know if you have any questions! Click any image to enlarge! 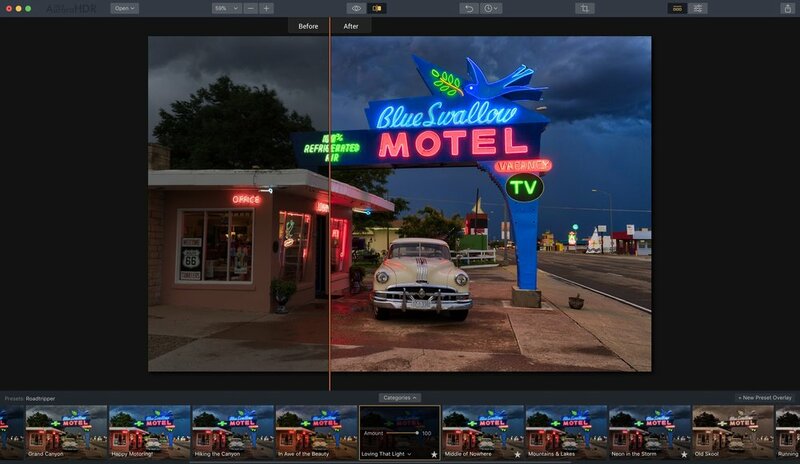 Do you need help using Aurora HDR? Want to create masterful HDR photos? One thing that I decided to do, upon the release of Aurora HDR 2018, was to create a tutorial series on YouTube. I used to write out lengthy tutorials but I find videos are much better for this. You can follow along and watch what I do, instead of just read about it, and I think that's way better. So, if you need help with Aurora, check out my Aurora HDR 2018 Tutorial Series over on YouTube. The tutorial itself is a collection of 10 videos covering the basic all the way to advanced techniques, and there are a few other videos in the set, too. I think you will enjoy this quite a lot! And yes, these are all free! Click here to see my entire collection of Aurora HDR 2018 videos. Here's a sample of what you will see there...enjoy! Thank you and enjoy the presets!